The Operations Department is responsible for the 24/7 operation of the District’s sewage treatment plant and biosolids disposal. The plant has an average dry weather flow of 12.2 MGD, with a design flow of 20 MGD. The treatment plant is jointly owned by Oro Loma Sanitary District (75%) and Castro Valley Sanitary District (CVSD) (25%). Under long term mutual agreements, CVSD reimburses the District for operations and maintenance costs for wastewater treatment, based on its actual contributory sewage flows (approximately 27%), and 25% for capital costs, based on its ownership interest. 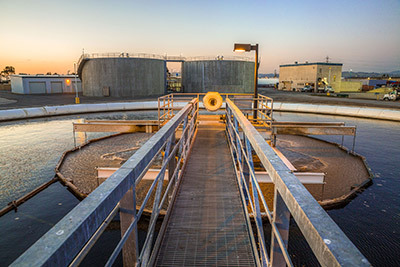 In addition to operating the plant, staff is involved in the operation and maintenance of the East Bay Dischargers Authority pump station, Skywest Golf Course water reclamation facilities, laboratory services, pretreatment activities, and compliance with numerous governmental regulations regarding treatment and disposal of wastewater and its byproducts. Zero lost time accidents in all years and zero “reportable injury” years (3 out of 10 years). Develop written operator training program for all areas of the plant. Develop annual “watch list” of emerging regulations, key regulatory contacts, and participate when warranted. Renegotiate EBDA agreement to reduce/eliminate District responsibility for replacement of conveyance system it does not use. Build video library of critical situation response; use video for debrief and future training. Optimize plant energy and chemical use through ongoing process control and evaluation. Track ongoing discussion of nutrient regulations and potential technical responses. Achieve 100% regulatory compliance with local, state and federal requirements. Ensure that department expenses are managed within the limits of the adopted budget.